The Friday Five Notebook is here with your to-do list...or at least a few fun ideas to keep busy! Here are things I'll be checking out over the long weekend, besides shopping of course. 1 Clinique Gift with Purchase at Bloomingdales with any $30 + purchase. I only buy Clinique when a GWP is available and this one is has an $85 value. the freedom to style and build the ultimate look on tablets and mobile devices. Did I mention celeb stylist Rachel Zoe is a brand ambassador for the game? Bananas. 3 Gal Meets Glam shares her beautifully decorated home with plenty of inspiration to go around. 4 Scatter My Ashes at Bergdorf's DVD This new release is a must-see for every fashion lover - perfect for a girl's night in! Don't be scared off by documentary, think The September Issue. 5 Starbucks Pumpkin Frappuccino is back!! Do.not.miss. the best drink of the season, for realsies. Labor Day Sales - Let's go shopping!! As summer officially ends this weekend, it's a great time to take advantage of some major sales with extra discounts galore. Don't take my word for, check out all the deals for yourself! I'll be updating this post throughout the weekend with any additional sales and codes as they become available. 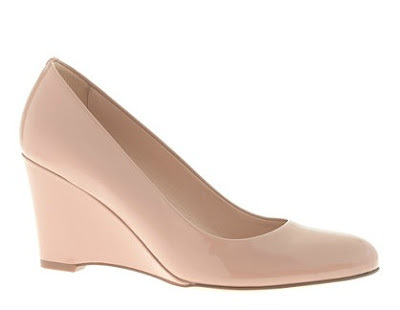 Ann Taylor 40% off regular price + extra 30% off sale - no code needed. 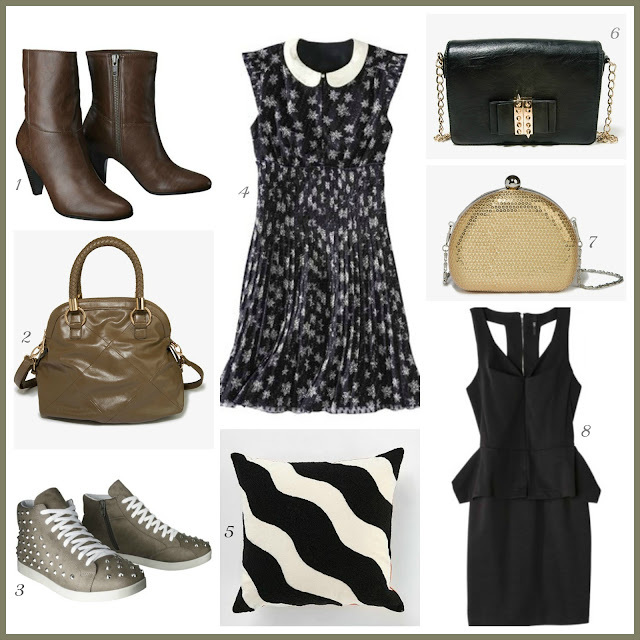 For even more Sales + Deals, Check out Franci's Labor Day picks over at The Fashion Palate! Thanks for reading and Happy Shopping!! I challenged myself to find some chic-worthy items for less than ten dollars and here is what I found! 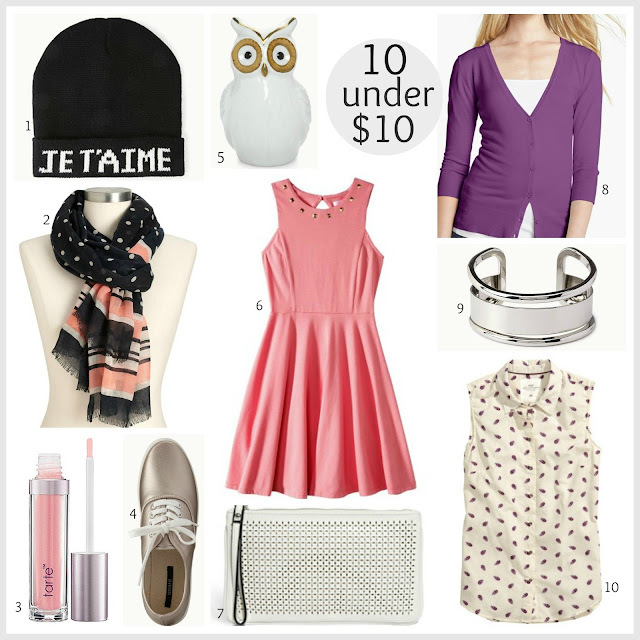 What's your favorite cheap chic item? 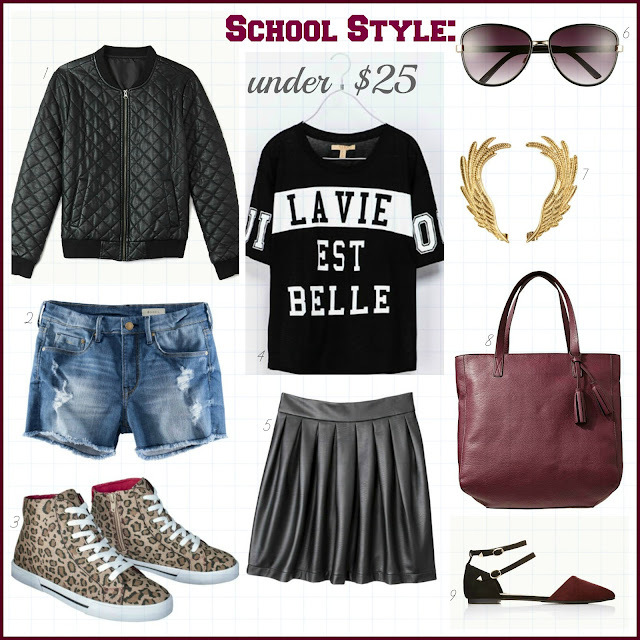 1 Beanie French inspired everything is on trend for fall and this is too cool not to own. 2 Scarf Polka-Dots and Stripes together? Enough said. 3 Lipgloss Grab this while you can - it's just a hint of color (I would use this to layer over lipstick) and chemical-free. 4 Sneakers When you want to add some glam to your everyday errands. 5 Owl Bank An owl with gold accents is too chic to pass up! 6 Dress This studded dress can easily be worn through the fall season with some darker hues or gold. 7 Clutch White is the new black..or at least still very much "in" for fall, love the details. 8 Cardigan N. Rack sells this cardigan year round and this is a great basic to own. I have many colors and they last forever if you take care of them. 9 Cuff This beautiful bracelet sets reminds me of Tiffany jewelry. 10 Top Wear now in the summer and throw a cardigan over in the fall w/ plum accents. *Asos - Free Shipping both ways! I stopped at Macy's to see if they had anything new worth sharing and I am happy to report the answer is a big yes! Thanks to the new French inspired Maison Jules Collection that debuted very recently. This line reminds me of Anthropologie, although it is definitely more affordable and accessible since not all of us are near an Anthro store. While most of the items aren't in this fashionistas budget, it is Macy's after all, so expect sale prices soon. They do have some basic t-shirts, tanks, and various cute striped tees for under $25, but the star pieces are the adorable dresses and Carrie Bradshaw style sweater. I tried on a few things so I can grab what I want in the the correct sizes when they do hit the sale rack. 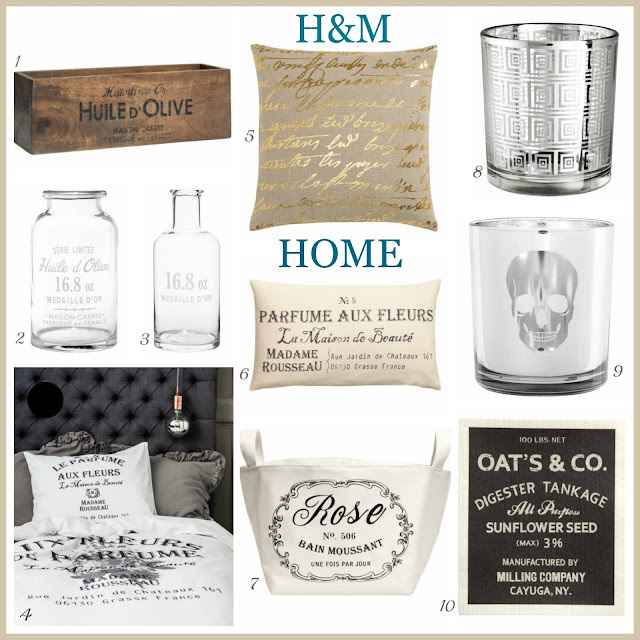 Will you be shopping this collection - any favorites? I love the idea of back to school shopping..even though I'm not actually in school, it doesn't mean I can't find another excuse to hit the stores! I'll wear these too cool for school pieces any time of the year. Shopping Notebook: Nordstrom Rack and Marshalls!! I did a little shopping at two of my favorite stores this week and there are lots of swooning to be had with so many designer deals at Nordstrom Rack and Marshalls. While I did more browsing than buying, I always have fun snapping pics and sharing my finds with everyone. Enjoy! This Ipsy bag is one of my favorites! Ten dollars went a long way and included almost fifty dollars in beauty products. The "Glamour Academy" theme to celebrate back to school is super cute and I am always happy to receive anything from Urban Decay (which is becoming one of my favorite beauty brands). The best part of the August bag is that I will be using every single item. Sign up here to get next month's glam bag before another wait list starts!! What did you get in your Ipsy bag this month? Bloggers - add your link below to share! Old Navy Fall Sweaters are here!! 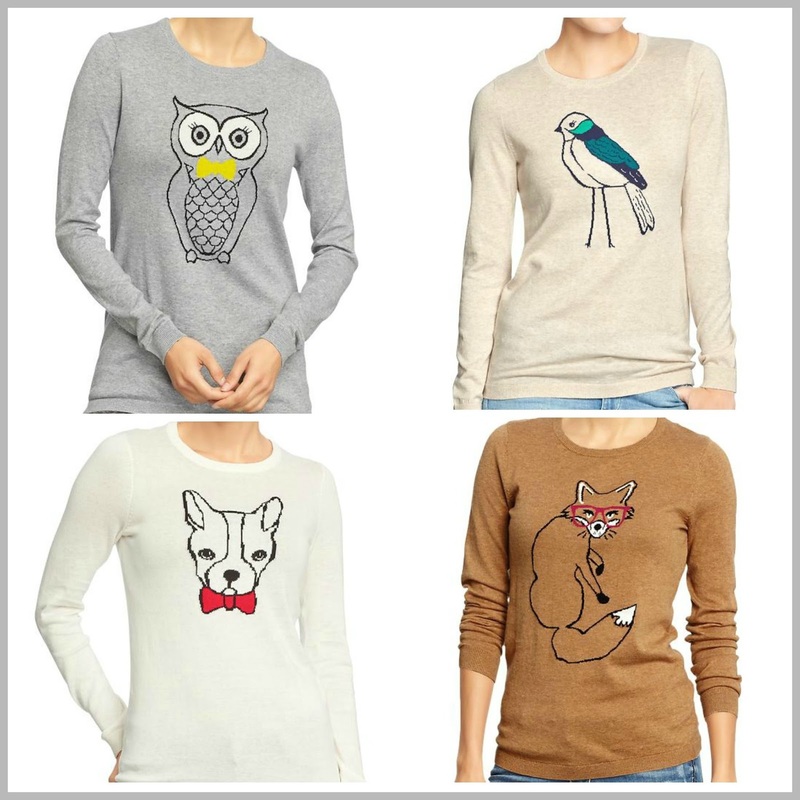 owls, foxes, and birds oh my!! 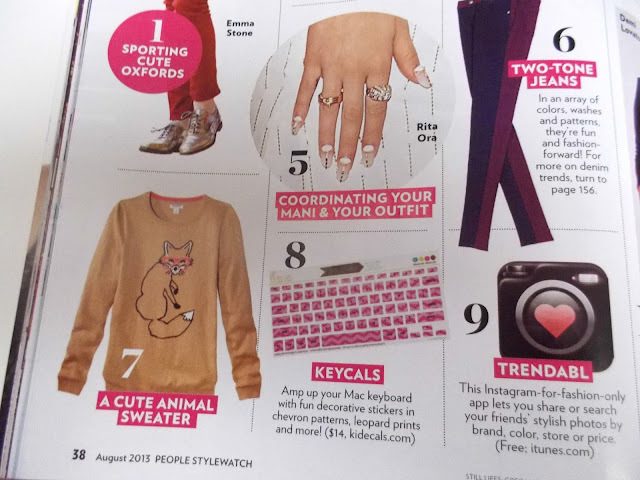 I have kept a watchful eye online and in store for the arrival of Old Navy's new fall sweaters featuring more adorable animal motifs ever since I spotted them in People StyleWatch magazine. Today, they are available to buy online and with a 30% discount. Many of these "trends" are here to stay..at least through another season. Lately, I have been adding a few black, cream, and gold pieces to my wardrobe that can easily be paired with darker fall colors. These purchases are so recent, I am still waiting for some of my packages to arrive. Of course, all of my shopping was done before I realized that my entire September (and probably October) budget would be spent on the 3.1 Phillip Lim for Target Collection. Shop Michael Kors Beauty here. 1 Tunic Dress I am a sucker for a chevron print and the faux leather detail on the shoulder is an added bonus. I'll wear it with tights in the cooler months. 2 Ballet Flats This very Chanel inspired flat will work well with everything. 3 Lipstick I have stopped at a few Macy's stores to try to see the new Michel Kors Beauty Collection with no luck - I finally decided to just order one of his lipsticks and I love the gold packaging. 4 Camera Bag I always say the same thing about the quality of most Forever 21 Hangbags and I really am impressed with their versions of popular bags - this is nearly identical to J.Crew. 5 Bow Bracelet I picked this up in the Junior Dept. It's a small little bracelet that doesn't fall off of my small wrist (sold!) and reminds me of Kate Spade of course because of the bow. I had my eye on the J.Crew bag since it arrived in early summer, but looking at the Forever 21 bag, I actually like the hardware better on the "Steal" version and I saved over $100 not buying the original. 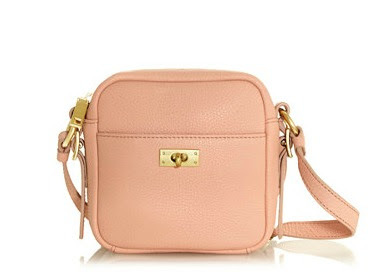 J.Crew Mini Bag $148 - sold out. 3.1 Phillip Lim x Target Look Book is here!!! Mark your calendars, set your alarms, because you have a "save the date" with Target this September! 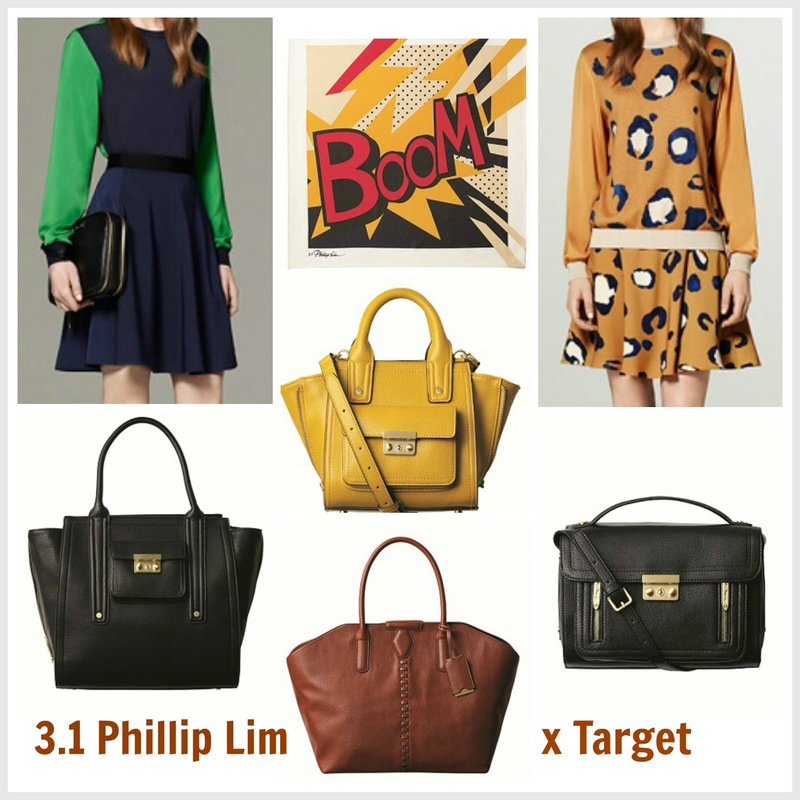 The 3.1 Phillip Lim for Target Look Book is here and holy handbags!! I am already saving my money to buy one (or four) of the bags. For $35 you can rock an authentic knock-off of the original 3.1 Phillip Lim icon bag that would cost you $650! I am way too excited about this collection arriving in Target stores and online September 15 with prices starting at a very affordable $19.99. Thanks to The Fashion Palate for making my Monday courtesy of Shefinds.com for the first pics. Summer clearance sales just got even better!! Just when you thought prices couldn't go any lower, along come additional discounts on top of the clearance prices..still not shopping yet? A good tip when shopping end of the summer sales, buy fall colors, black & white, or neutral colors to stay ahead of the fall season by choosing well and saving money. 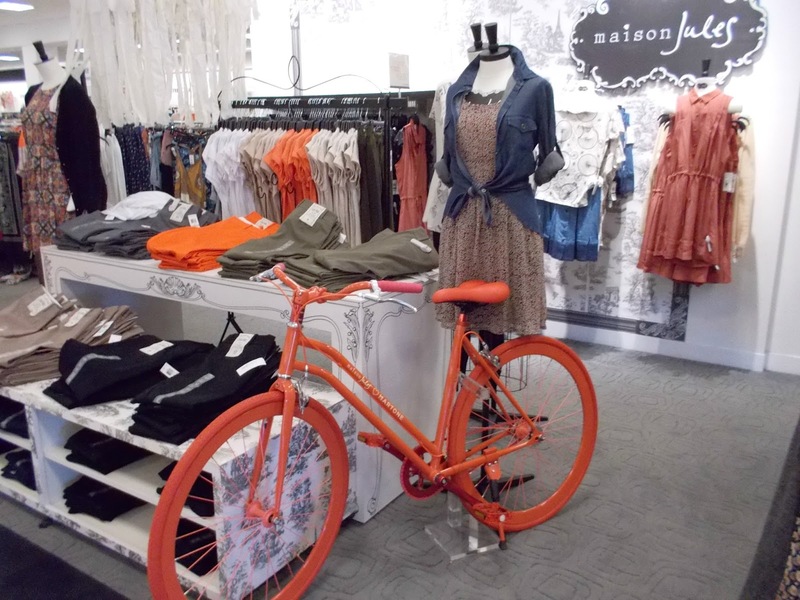 Have you started shopping for fall clothes yet? *Everything shown is with discount already applied. These are just a few of the many sale items available! Stock up on formal attire by Kate Young a few months after it debuted at Target, dresses are around twenty dollars. I'm finally purchasing this dress I've had my eye on, but never found my size in stores. 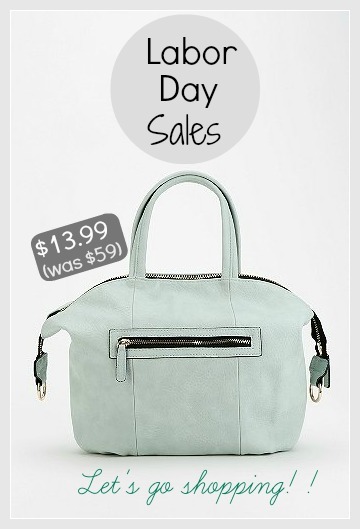 After doing some shopping at Forever 21 this past weekend, I'm glad I didn't shop the clearance rounders, since I can save even more now, and the large olive handbag has always been a favorite of mine, perfect for a back to school bag or cool work tote. Urban Outfitters is an unexpected place to shop for fun home items, take a peek. H&M SALE - under $10!! Sometimes procrastination pays off..literally. Almost a week since H&M launched their e-commerce site for the U.S., weekly deals were just added for those of us who still haven't placed our orders and nothing is over $10!! Don't wait too long to shop, sizes are going fast. Check out the men and kids departments too for more deals. What will you be adding to your shopping cart? Have you shopped online yet? *More colors and patterns are available for everything shown. Keep in mind, stores are not accepting online returns. Save 20% off one item on LikeACoupon and follow the instructions for Facebook users. Sign up for e-mail here to receive free shipping on your order. Keri Russell looked sophisticated chic over the weekend at the famous Chateau Marmont in Los Angeles. Pull this style off by mixing and matching your black and white/cream pieces to achieve a modern evening look that screams Old Hollywood. By now, most of you have heard the exciting news that retailer H&M is now available to shop in the U.S. online. While yesterday's post focused on their amazing selection of home items, today's will be all about their affordable clothing and accessories (my favorite part of their store!). With so many great pieces to shop, I decided to narrow it down by choosing a weekend look that can easily transition into your fall wardrobe adding some cool pants or boyfriend jeans instead of shorts. I pretty much want everything on this page..is that wrong? 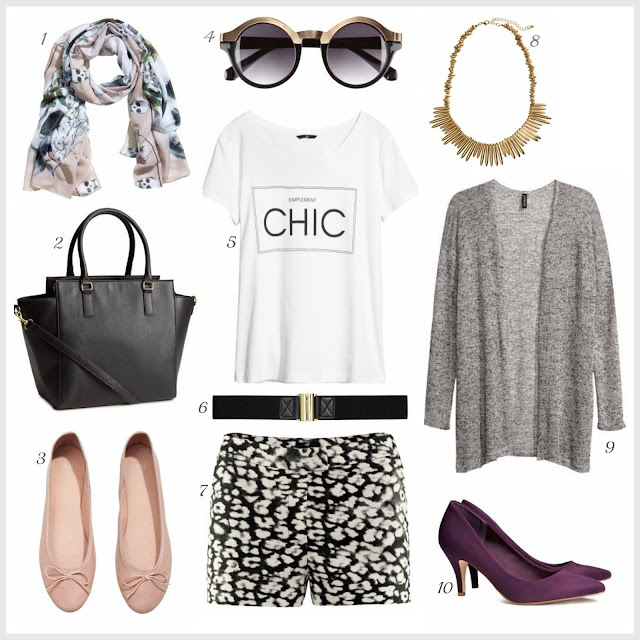 Have you shopped H&M online yet - what are your favorites? Shop online here . * Keep in mind, that stores are not accepting online returns. 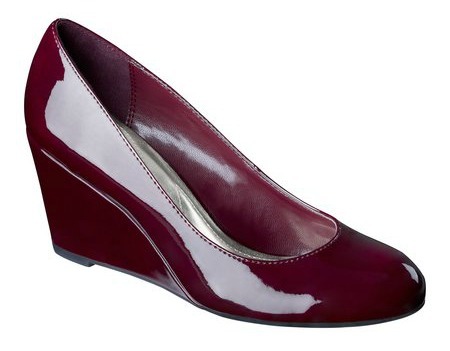 Thanks to Franci over at The Fashion Palate for this Facebook coupon. Go to LikeACoupon to take 20% off one item - stackable with Free Shipping, just follow the instructions to save! Sign up for e-mail here to receive free shipping. Just yesterday, I mentioned in my blog post that H&M had announced their online store for the U.S. would launch in September..well, September came early and shopping online is now a very happy reality!! The affordable and chic home store is what has me most excited. This modern meets vintage style includes duvets sets for less than thirty dollars, kitchen items with a very Anthropologie vibe, and all around fun accessories. Since I haven't seen anything in person, I can't comment on the quality of the merchandise, but that won't stop be from buying a few items that are in my shopping cart..someone has to review them! Check out everything for yourself, there is so much to see and an affordable way to update your space. * Discount codes at the end of this post. Will you be shopping online - what are you favorite items? *The pillows inserts are not included and must be purchased separately.